Have you ever lost important files? 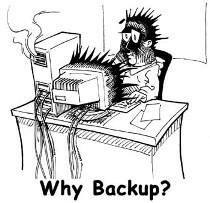 Backups can mean the difference between a mild setback or living through your own personal disaster. Backing up your data is crucial. For businesses, data loss can cause days of lost productivity and can even lead to business failure. Individuals who don’t backup can lose cherished files like family photos. Backup software now makes it easier than it ever was before. Backups can be scheduled to automatically run at any time you choose – without interfering with your busy life. Whether you choose to backup to local media or an online service, don’t forget to regularly test your backups! Backups are worthless unless you know you’re able to restore your data when you really need it.